SLorktastic Chamber Music 2010 :: April 29, 2010; 8:00 pm :: CCRMA Stage, Stanford University, 660 Lomita Dr., Stanford, CA. The Stanford Laptop Orchestra (SLOrk) presents all new works for electronic chamber music, by members of the SLOrk ensemble and seminar and featuring special guest Jordan Rudess of Dream Theatre. You are cordially invited to join us in exploring new sonic spaces + musical places with performances crafted for humans, laptops, iPads, and hemispherical speaker arrays! 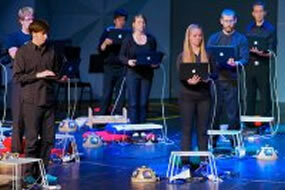 For details go here or visit Stanford Laptop Orchestra on Twitter or Facebook.